In one of history’s false starts, the Japanese victory at the Battle of Tsushima in 1905 seemed to mark Asia as the next dominant region. While such a power-shift did not occur, Asia gave rise to a group of remarkable thinkers. In his portrait of leaders such as Tagore and Gandhi in India, Liang Qichao and Sun Yatsen in China, and Jamal al-Din al-Afghani in the former Ottoman Empire, Mishra, author of Temptations of the West, paints a picture of an extraordinary time and place. Mr. Mishra will be in conversation with Madhulika Sikka, executive producer of NPR's Morning Edition. **OFFSITE** Pankaj Mishra, "The Ruins of Empire"
Pankaj Mishra visits the Harold Washington Library to discuss and sign copies of his new book From the ruins of empire: The Intellectuals Who Remade Asia. Mishra also writes for The New Yorker, The New York Review of Books, The New York Times Book Review, and The Guardian. 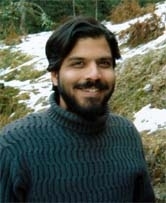 Pankaj Mishra is currently considered a "single author." If one or more works are by a distinct, homonymous authors, go ahead and split the author. Pankaj Mishra is composed of 5 names. You can examine and separate out names.